Rajnikanth and Akshay kumar starrer film Robot 2.0 directed by S. Shankar has recieved terrific responce at box office on the opening day of the movie. The movie registered an occupancy of over 90 per cent in south while it registered an occupancy about 30 percent in hindi belt largly . 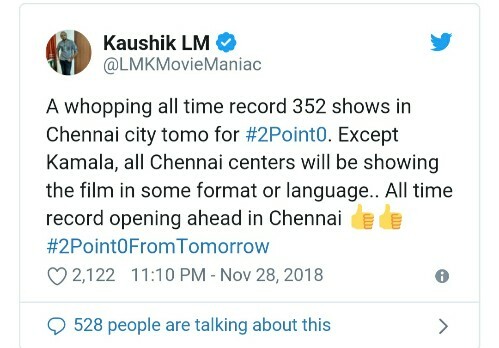 The movie got more respoce from public than their words . 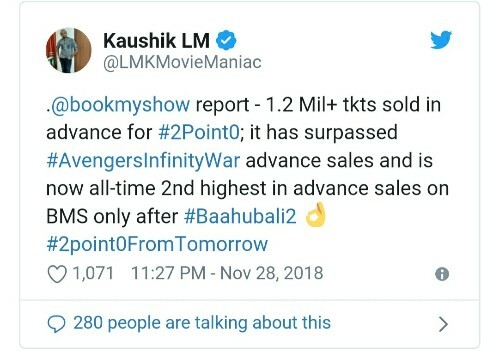 Although it couldnot beat Bahubali 2 based on opening day of earning. The Bahubali 2 was earned 121 crore in India. Talking about countrywise ,the estimated earning from all over the world has reviceved much money than their expectation. Robot 2.0 has earned around 59 lakhs ($83.720) from 35 screen in australia. As per Ramesh Bala, the trade analyst the 2.0 has earned 285 lacks ($282.967) from the United states. The first indian 3D film 2.0 has earned 11.11 lacks ( 15,920) in New zeeland from 18 screens. The hindi version of 2.0 earned 20.25 crore on the opening day , while it has managed to collect 19 crore on the second day .